Fabergé is famous for the enamelled and jewelled objects he made for Tsar Nicholas II and his wife Alexandra. He took over his father’s business in St Petersburg in 1872 and later also conducted extensive business through a London branch. In 1900 he won a gold medal at the Paris Exhibition. Fabergé’s carved hardstone figures and the superb quality of his enamelling influenced even the great French jewellery houses. Like many 19th-century goldsmiths, Fabergé often found inspiration in earlier styles, including archaeological jewellery, the Baroque court of early 18th-century Dresden and France in the age of Louis XVI . Sometimes he is indebted to Russian traditions or to the East. 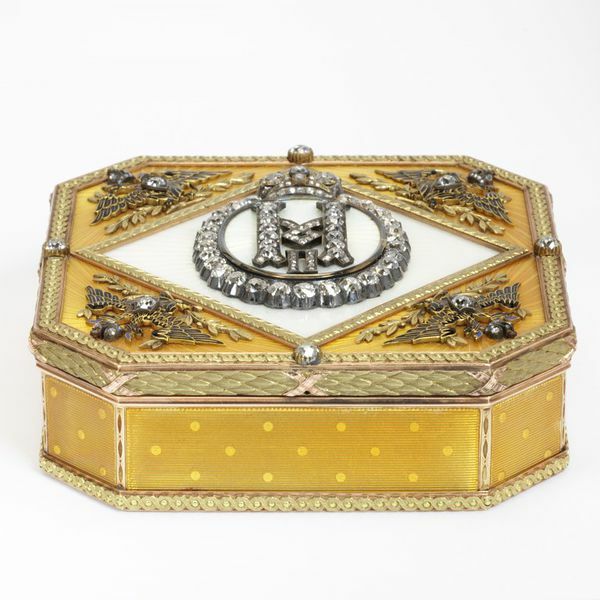 Varicoloured gold presentation box with enamel and brilliant-cut diamonds. Decorated on the lid with the crowned cipher of Tsar Nicholas II, surrounded by Imperial eagles, commissioned from Carl Fabergé, mark of Mikhail Perkhin. Gold presentation box with enamel and brilliant-cut diamonds, with the crowned cipher of Tsar Nicholas II, surrounded by Imperial eagles, commissioned from Carl Fabergé, marks for 1898-1903 for Mikhail Perkhin.